Want to stop bullying? Stop focusing on why it’s happening. It is easy to assume that all behavior has a reason and that we humans are rational actors and our decisions and actions have a reason behind them. Figure out what that reason is and you can convince people to behave differently. That’s a nice idea, but the world doesn’t work that way. Humans run on instinct a lot. We do what works without thinking about it much. Consciousness is a very tricky thing to pin down and what decisions are made consciously vs. unconsciously is debatable. And by debatable, I mean scientists aren’t sure if we actually have free will or not or if we just think we do. I’m not going to get into the science of whether or not bullies have free will or not here. What I do want to point out is that focusing on why someone is behaving badly is focusing on the wrong thing. Why does it matter why? Shouldn’t we be focusing on getting them to stop? The problem with focusing on why bullying happens is that we don’t actually know why it happens. Or rather, there could be a wide variety of reasons why someone bullies. What we don’t know is in any given situation what that reason is. The last thing we should be doing is asking kids to psychoanalyze their bully before we help them. The other problem is that – all that psychoanalyzing hasn’t helped us fix the problem. It doesn’t help us point to a solution. Since pondering why bullies bully hasn’t yielded solutions, it’s time we redefine the problem. Instead of focusing on why someone is behaving badly let’s focus on the fact we don’t want them to behave badly. Instead of asking why, we are now asking, what needs to happen to make them stop. If you are fond of the why question, you are probably thinking, well, you can’t stop them until you know why they are behaving the way they are. You are wrong. That is a proxy problem. A problem that is standing in for the actual problem. The actual problem is how to get them to stop. Why they are bullying doesn’t help us answer that question. In order to get a behavior to stop, you need to stop rewarding it. Consistently over time. The behavior will escalate for a while and if you continue to withhold reward, the behavior will eventually extinguish. This is teachable and it works. We should be teaching it. So the next time a kid comes to you and says they are being bullied, don’t ask them why they are being bullied. Ask them what exactly the bully is doing and help them figure out how to stop rewarding the bully so that they can make them stop. Why the bully is bullying doesn’t matter. What matters is making them stop. 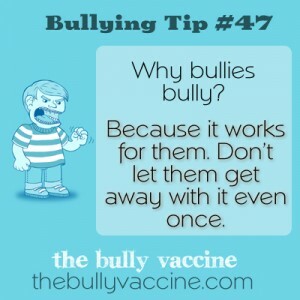 Learn more by joining this website and by buying my book – which provides step by step guide in exactly what has to happen to get a bully to stop.